Myss Lafunky's Blog: The SWAG Christian | What's the fuss about? 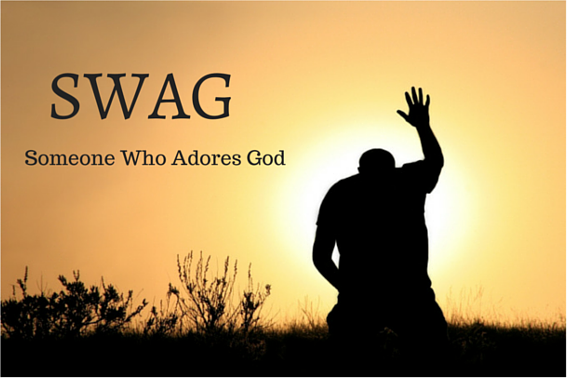 Ever wondered why it is cool to be part of SWAG Christians, and are you aware of the benefits? To be SWAG is to be Someone Who Adores God. How can you as a Young Person be SWAG? Read your Bible every day and Obey the gospel of Christ. Build a Christian personality and character. Serve God and use your talents for God. Be faithful throughout your life. Prepare to have a Christian home. Prepare yourself to have a decent profession; to be the best in your career. Have you identified any of the above points that you need to improve? Make a list of ways that you need to increase being SWAG. God will be revealing the hidden and secrets things to you (Jer 33:3). How awesome is it for you to be privy to information that others do not know. the instant thought this gives to me personally is that it is highly possible for me to truely represent God in the days and seasons that we are for every man outside God represents that which he believes in even though it adds no authentic gain that can last over time to their lives in actual sense. Yes Anonymous. God continues to work in us to ensure that our lives give Him glory and that we please Him always. Our role is to continue to BELIEVE in Him through all that we do, think and act by His Grace. Yes Yes! I LOVE that title- A Jesus SWAG. Amen. Thank you so much for taking your time to comment.